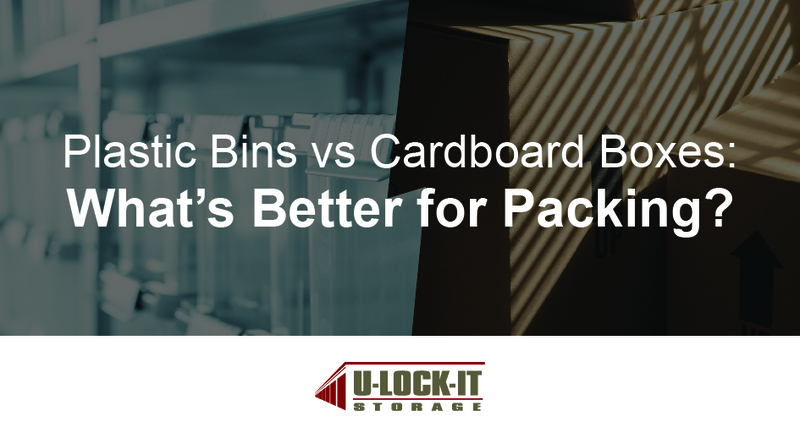 While this may not be the most heated debate out there, and ultimately the choice in packing is up to you, it’s good to weigh the pros and cons of the two very popular packing options: plastic bins and cardboard boxes. Knowing which is ultimately better for a storage unit will keep your valuables safe should you choose to store them in the future. Cardboard boxes are readily available at grocery and liquor stores for a small price. Ask the owners if they have any boxes they’re willing to donate for packing to help save you money. If you opt to use donated boxes, you can feel good about the fact you’re repurposing them. Afterwards, you will be able to recycle them even further. With the trusted work of a sharpie, you’ll be able to know what every box contains, as well as what’s fragile and what direction certain boxes should go in. Cardboard breaks down quickly and is, unfortunately, not water resistant. If cardboard gets wet in storage, your items will be susceptible to mold, mildew, and other damages. Cardboard is a good source of food for some insects (cockroaches, eek!) and also provides a warm place for them to go that’s easy to get in to. Items may be more susceptible to damages when stored in cardboard boxes. If your belongings are stored in cardboard for a long time, don’t expect them to be as pristine as they were when initially packed away. As long as the plastic bins you’ve purchased are securely closed and in good condition, they will protect contents from moisture and bugs (which happen to be attracted to cardboard, as mentioned above). The many colors and sizes make plastic bin storage a breeze. You can color code your belongings, or go with clear bins so you can see exactly where everything is. While cardboard boxes may be reusable for future storing as well, plastic bins really stand the tests of time. You will most-likely have to replace a cardboard box before a quality plastic bin. Unlike cardboard boxes, you probably won’t be scoring any plastic bins for free. Not to mention the cost disparity between cardboard boxes and plastic bins can be significant. Depending on bin size and quality, a large plastic tub can be over $10 when large cardboard boxes run at about $0.80. While most cardboard boxes are made from post-consumer recycled material and can be recycled again, bins are made from plastic which takes significantly longer to break down. After thoroughly going over both options, plastic bins win the battle when packing things up to go in storage, but cardboard boxes are great for a move across town when your belongings won’t be packed away for a long time. And while plastic bins “win,” you can choose to pack with both. Just stack accordingly and prioritize where more valuable and fragile items will be stored. If you’re interested in getting a self-storage unit to improve your organization or make life easier between a move, contact U-Lock-It storage in Madison, AL. Give U-Lock-It a call at 256-373-5495 and ask them about their storage unit rates and options.